Peter ten Kate was born in Leeuwarden (The Netherlands) in 1977. He has been interested in church organs since his childhood. He took his first organ lessons when he was 9 years old. This took place in Leeuwarden at the Music School. His first organ teacher was Mr. Anne Dijkstra. After he had moved with his parents to the city of Hoogeveen in 1991, he took his organ lessons at the Music School in this city. His new organ teacher became Mr. Harrie van der Veen. The lessons were given on the beautiful Scheuer/Van Oeckelen organ (1843) in the Reformed Church in Hoogeveen. After several years he changed to another organ teacher. This was Mr. Daniël Rouwkema, organist of the Reformed Church in Smilde. Peter played the organ during a service for the first time when he was 13 years old. At the age of 15 he became an official church organist. This was in two churches in the village of Pesse, near Hoogeveen. Several years later, he became organist of the Reformed 'Zuiderkerk' in Hoogeveen. 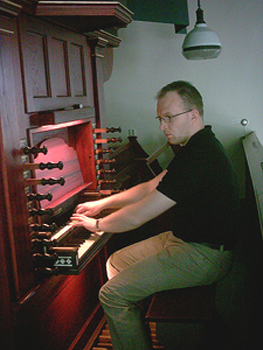 Since 2000, he is the official organist of the Reformed Church in Zuidwolde, a village near Hoogeveen. This church has a beautiful organ that was built by Jan Doornbos in 1902 and completely restored in 1972 by Hendriksen&Reitsma. Also he is organist of the Protestant Vredehorst Church in Hoogeveen. Peters musical orientation is very large and varies from the Baroque period to the Romantic period. Music from J.S. Bach is his favorite music, but he also likes the romantic music from Dutch composers like Jan Zwart en Feike Asma...and of course plays this music. 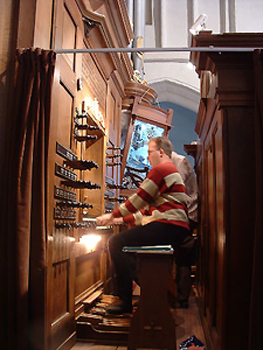 In the last severals years Peter has played on a large number of church organs in the Netherlands. Among these there were some very famous organs, like for example the Hinsz organ in Kampen (1743), The Hinsz organ in Bolsward (1781) and the Garrels organ in Maassluis (1732). But he has also played on a lot of smaller and less know organs. Most of these organs can be found in churches in the Northen region of the Netherlands (the provinces of Fryslân, Groningen, Drenthe and Overijssel). All these organs are described on this website, with photos and dispositions. You can find them if you choose the button "Bespeelde orgels". Playing organ is wat Peter likes very much, but this is not his profession! He's just an amateur organist. He studied Commercial Economics at the Hanze University in Groningen and Business Economics Marketing Management at the University of Groningen. He works for the Northern Netherlands Provinces (SNN) since 2003. He is married to Anneke van den Berg (2005). They live in the city of Hoogeveen, together with their two children.